What makes it hard for me to comment on some developments regarding the EU Copyright Directive as harshly as I'd like to is that there are some Members of the Europen Parliament (MEPs) involved with whom I got along very well in other contexts. Otherwise I'd have voiced some outrage here over EP President Tajani's refusal to accept the SaveTheInternet petition signed by 5.1 million people, and I'd express outrage now over a proposal by Othmar Karas MEP, an Austrian conservative (but a different kind of conservative than Austria's chancellor Sebastian Kurz). It would be a better choice for Mr. Karas to support his colleague (from the same political group, the European People's Party) Tomáš Zdechovský's call for repeating the European Parliament vote on whether or not to allow votes on individual amendments than to toss out proposals that look helpful at first sight but are highly unlikely to solve the problem. That's what's called misleading voters, by the way. But I won't say anything harsher than that for the reason I gave further above. 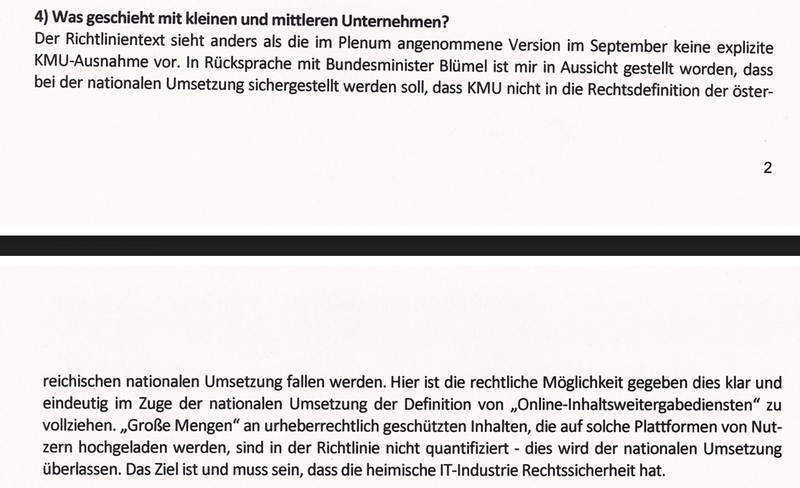 Mr. Karas tells voters that Austria's Chancellery Minister for the EU, Art, Culture and Media, Gernot Blümel, assured Mr. Karas that it would be possible to limit the scope of Article 13/17 to platforms that have so many users that startups would benefit from a de facto exemption. The directive doesn't apply to companies that are less than three years old, generate annual revenues below 10 million euros, and have fewer than 5 million monthly users, but if a company meets only one of the criteria (such as a company that's four years old), it doesn't benefit from the explicit startup exemption in the EU directive. The loophole that Mr. Karas suggests he has identified is that the directive doesn't contain any numerical definition of what platforms are large enough to fall within the scope of the directive. It's clear that a platform must have a significant quantity of copyrighted content uploaded by (and viewed by= users, but no number is specified. 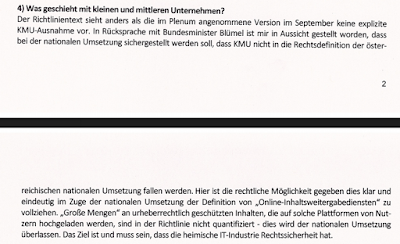 In the Austrian implementation of the directive, Mr. Karas and his Österreichische Volksparty (Austrian People's Party) plan to require a quantity that they say startups simply won't reach. (the real issue!) as long as they just operate in Austria and in countries that adopt the same approach to a wide-ranging startup carveout. Copyright law, like all other fields of intellectual property law, is territorial. It's specifically excluded from the "country of origin principle" of the e-commerce directive. Therefore, an Austrian company wouldn't be able to claim that the Austrian implementation of the directive applies to any enforcement against it. Instead, the place where an alleged infringement occurs will matter, and that's where a user accesses the content in question. The Austrian market is so small that many Austrian Internet startups don't focus exclusively on their domestic market. Instead, they typically offer their services to other German-speaking users as well--and some expand to other language markets, too. Mr. Karas is right to have concerns over the impact of the directive on startups, but what he proposes is not a reliable solution, and if other EU Member States don't adopt this approach (or if they do but the CJEU holds such wide-ranging exemptions to be irreconcilable with the EU directive, which trumps national law at the end of the day), it's not really useful. There would inevitably by forum shopping (plaintiffs would go where they find the most favorable legal framework and sue there if a potential infringement is location-independent).